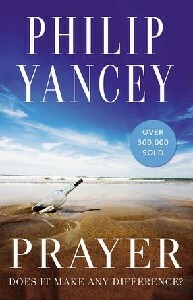 ~In his most powerful book since What's So Amazing About Grace and The Jesus I Never Knew, Philip Yancey explores the intimate place where God and humans meet in Prayer. Polls reveal that 90 percent of people pray. Yet prayer, which should be the most nourishing and uplifting time of the believer's day, can also be frustrating, confusing, and fraught with mystery. Writing as a fellow pilgrim, Yancey probes such questions as: â€¢Is God listening â€¢Why should God care about me â€¢If God knows everything, what's the point of prayer â€¢Why do answers to prayer seem so inconsistent â€¢Why does God sometimes seem close and sometimes seem far away â€¢How can I make prayer more satisfying Yancey tackles the tough questions and in the process comes up with a fresh new approach to this timeless topic. â€œI have learned to pray as a privilege, not a duty,â€ he says, and he invites you to join him on this all-important journey.